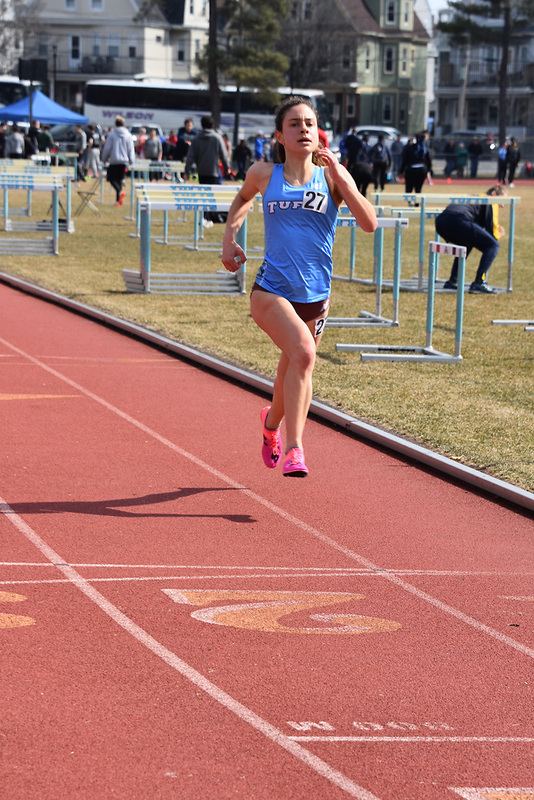 On Saturday, the Tufts women’s track and field team competed against Rensselaer Polytechnic Institute (RPI), MIT and NESCAC opponent Bates at MIT’s Morrison Track in Cambridge, Mass. Many of the athletes had nationally ranked times and the team took first in the event, their second consecutive first-place finish of the outdoor season. Senior Kylene DeSmith had an outstanding individual performance at the meet. Out of the five events she competed in, she achieved personal records in three of them. Desmith ran a 27.06 time in the 200-meter to take ninth out of 18 competitors, earning one of her three personal records of the day. She took second in the 100-meter hurdles with a 14.98 time, currently the 25th best time in the nation. She then went on to take sixth in the high jump to earn her third personal record of the day. DeSmith also commented on the transition from the indoor season to the outdoor season. The Tufts 4×400 relay team, comprised of junior Julia Gake and first-years Hannah Neilon, Luana Machado and Tara Lowensohn, took first in their event with a time of 3:59.76. Their time currently sits 15th in the nation. Neilon claimed her second victory of the day in the 400-meter, winning it in a time of 58.90. The Jumbos were also dominant in the field events, claiming three first-place finishes. Senior co-captain Evelyn Drake took first in the hammer throw with a 155’6” throw, currently 38th in the nation. Sophomore Nkemdilim Aduka won the discus throw with a 123’5” mark. To round out the field events, junior Julia Kissel took first in the javelin throw with a 117’5” mark. The thrust was just over 10 feet shy of her season best of 128’6”, which she accomplished at the Tufts Snowflake Classic. By the end of the day, Tufts accumulated 198 team points, just beating out MIT’s 194. RPI took third with 138 points, while Bates finished fourth with 134. The Jumbos were pleased with how the team finished. The Jumbos attribute their success to their passion for outdoor and the morale boost that comes along with the great weather Boston has been blessed with. Field events like the hammer and javelin throw are other additions to the outdoor meets that help the Jumbos’ team performances. Up next, the Jumbos compete in the Silfen Invitational at Connecticut College on April 12. The team is looking to keep up its string of great results at this next meet.